AMD Radeon Software has seen several annual updates over the last few years, however, Adrenalin 2019 Edition is bringing some of the biggest and most unique features we’ve seen yet, particularly introducing VR and game streaming to your phone. 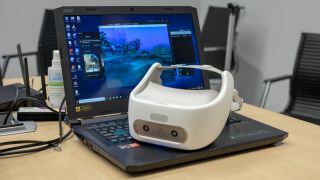 AMD Radeon Software Adrenalin 2019 Edition’s single biggest feature has to be ReLive for VR, which essentially lets players stream VR games running on their PC to a phone-powered VR headset (i.e. Google Daydream View and Samsung Gear VR) and standalone VR headsets (i.e. the HTC Vive Focus). This all might sound bananas, but it really works well. During a short demo, we hardly experienced any lag or slowdown in frame rate that would have caused us a bout of nausea. Instead, we were able to freely look around just as if we were playing VR games with a traditional headset hooked up directly to a PC. By linking AMD’s Radeon Software on PCs with the Radeon ReLive VR app on phones and standalone VR headsets, players can access their full catalog of Steam VR games. Of course, visuals take a small tick down, as they’re tuned for low-latency and to ensure a seamless experience. At the same time, the program utilizes low-level hardware acceleration to optimize streaming from your PC to a mobile VR headset. Not only does this give users a great way of experiencing completely wireless VR, they can also experience more high-end VR games that were typically locked to the PC. It’s especially important to give PC-based VR games another place to live, as there seems to be no new Oculus Rift in sight and companies are now focused on introducing more standalone headsets. The AMD Link app will only initially available on the Google Play Store and HTC Viveport marketplace. It remains to be seen if the app will also come to the Oculus Store. At long last, Adrenalin 2019 Edition also introduces game streaming. Players will now be able to use their AMD Link app on iOS and Android smartphones to play games running on their PC through their phone. What’s more, players can expect up to 4K resolutions at 60 frames per second (fps) with low-latency while gaming on their tablets and phones. AMD claims its game streaming solution is even up to 44% faster than (unspecified) competitive solutions. To get started, users simply need to pair up the AMD Link app with their PC and – presto – they’ll be able to launch games with just a tap. The interface will introduce on-screen controls, but users will also be able to hook up their phone to a Bluetooth controller. Outside of gaming, AMD Link will also allow users to streaming their PC desktop, which will come in handy if you ever need to remote into your PC or just stream 4K video from your PC. Aside from VR and game streaming, Adrenalin 2019 Edition is also enhancing the way you can live stream broadcast to an audience. To this end, AMD is introducing a new Scene Editor to ReLive that allows users to pull in multiple recording sources and add graphics to create a dynamic streaming overlay. With the added ability to transition between scenes using hotkeys or the Radeon Overlay, this is essentially AMD’s version of OBS or XSplit for the Twitch broadcasters out there. ReLive has also received a few other smaller improvements including high-quality audio recording with support for multi-channel audio (i.e. all your teammates talking), in-game replay as well as easy GIF creation and sharing. Installer: streamlined with a simple one-click install process. Project ReSX: delivers improved FPS performance and 99th percentile frame times for popular PC eSports games to ensure a faster click-to-response time. Game Advisor: in-game performance testing that recommends quality setting changes to improve performance or increase image quality. Radeon WattMan: improved performance with auto-GPU overclocking and undervolting, memory overclocking and application-bound tuning. fan speed control and unlocked DPM state customization for Radeon RX Vega-series graphics cards. Radeon Chill: up to 20% greater power savings in games such as Fortnite, Overwatch and PUBG. FreeSync 2 HDR: improved auto-tone mapping for a more detailed picture across the frame and different levels of lighting across the frame. Radeon Overlay: added WattMan access while in-game and expanded performance metrics display. AMD Link: added voice control, Radeon WattMan access, Enhanced Performance Metrics access and live stream editing to create playback videos. Up until now, we've always felt that AMD's Radeon Software had a it bit more polish than Nvidia's GeForce Experience – but not nearly as many features. With Adrenalin 2019 Edition, it now seems AMD may have even surpassed Nvidia's software suite for the time being.